Resident Evil Revelations on 3DS was, and still is, one of the most impressive and well-crafted demonstrations of the handheld's capabilities. With accomplished visuals — combined with outstanding stereoscopic 3D — it delivered a return to form for the franchise, with large sections reverting back to older, and better, habits. That was on 3DS, but now Capcom has scrubbed up the graphics and repackaged the game for Wii U. The question is whether the scares, thrills and environments are as brooding, menacing and enticing as on the portable platform. 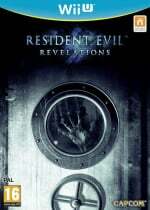 For anyone with experience of the 3DS original, one of the first thoughts when booting up Resident Evil Revelations on Wii U may be to scrutinise the visuals, as cynicism and wariness are to be expected when a handheld title is upscaled to a home console. What we have is a decent looking game, but nothing to celebrate or drool over; the art design is the winner, as it always was, while on a technical level everything looks nice and sharp. Its origins do betray it at times, with some plain textures and primitive lighting, but on the whole it's not displeasing to look at and isn't the worst looking game on Wii U. That said, if this engine was applied to a game with inferior artistic merit, the assessment would be harsher. So there's that, and we encountered some other niggles, such as animations that look borderline goofy on a large HD screen. Non-playable characters occasionally run like marionettes, while facial expressions can be a little bizarre, notably Jessica's glazed-eyed smirk when accompanying you on fixed missions. These flaws may lead some to unfairly criticise the 3DS original, but they aren't as noticeable on the handheld; these all highlight hints of an underlying laziness to this port. Those negatives aside, the actual game itself is still a treat to play. We can't help but cheekily wonder whether Capcom could have saved itself millions of dollars and simply called this Resident Evil 6, as on a fraction of the budget this title captures a solid middle ground that points the way for the future of the franchise. Through its setting, focused storyline, genuine scares and moments of ludicrous campness, it at once insists that you strap in for the ride and also refuses to take itself too seriously. It's not to the standard of Resident Evil 4, but it's arguably the best that Capcom's offered in the franchise since. As the Resident Evil Revelations campaign is split up into 12 chapters — lasting between eight and 10 hours in total — it seems fitting that the structure of the title varies wildly. These chapters — and the smaller sections within — take place throughout around half a dozen locations, with different dual combinations of characters. The assist character is CPU controlled in the main game — there's no online co-op in this mode — and generally follows you around to exchange the odd quip; they may even, if you're lucky, save you some ammo and kill the occasional creature. It's a dynamic that works in the context of the story, as you not only become familiar with Jill Valentine and Chris Redfield, but the interlocking roles of colleagues such as the dense but loveable Parker. Despite being a tad wacky, the story and its locations are a fine complement to the well thought-out gameplay on offer. Large parts of the title are spent on an adrift cruise liner, and its decorated interiors delightfully resemble an abandoned mansion, but with a sense of a nautical metallic shell at the same time. Scarier, survival horror parts of the experience revolve around this area, while action-packed sequences take place in snowy mountains or a futuristic city tower. Occasionally things are mixed up, too, as you're never quite sure when the focus will be on skulking around creepy corridors or fighting for your life against a dozen monstrous creatures. There are some excellent cinematic flourishes that we won't spoil, too, but we will say that some tense swimming — which thankfully controls well — is thrown in for good measure. 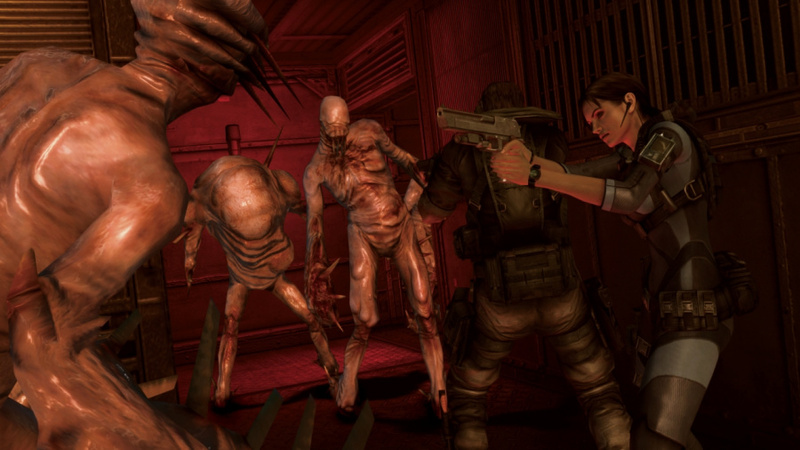 This pick-and-mix approach to Resident Evil gameplay ideas of the past ten years is joined by some other creative liberties that help to keep this entry fresh. 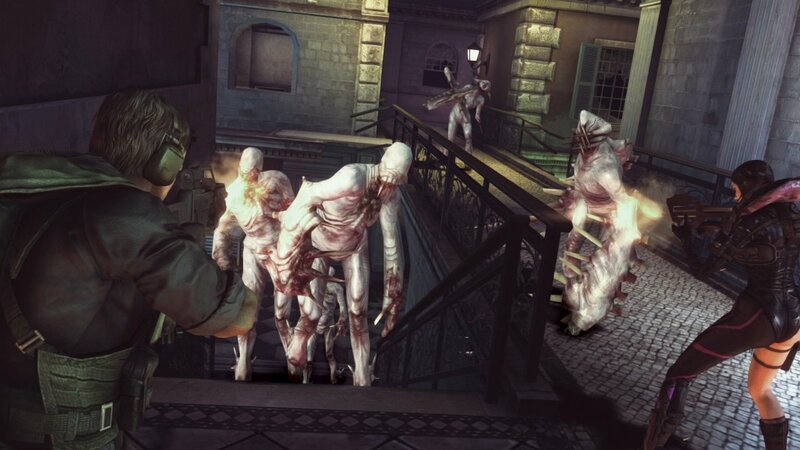 The enemies, for example, are not zombies or pitchfork wielding villagers, but rather the "ooze": slimy representations of humans infected by a new strain of virus. They've proven divisive, but for our money the variety of creatures, and notably the step away from previous standards, are welcome, with their jittery and slippery movements building tension when low on ammo. There are some memorable bosses that take a serious amount of weaponry to put down, and a frightening new creature that dishes out one-hit kills — the only let downs are the Hunters. These are quick beasts that try and claw your face off, which is fine, but lack a smoothness of movement even on significantly more powerful hardware. Thankfully, the controls are reasonably strong to back up the mostly excellent campaign experience. The default GamePad controls are similar to the Circle Pad Pro option on the 3DS — it's a standard dual-stick setup, with ZL and ZR intuitively used for shooting, while the face buttons and the D-Pad are used for interaction with items, using herbs and switching primary and secondary weapons. L is an important button, as you hold it to scan areas with the Genesis, which is basically similar to scanners in Metroid Prime Trilogy and ZombiU; unlike the latter, this doesn't utilise the motion controls of the controller in any way, so you just move with the stick. The touch screen implementation is minimal, as you simply tap hotkeys to equip weapons, and there's a fairly useful map in the middle. As you only carry a limited number of guns and there are button alternatives, little is lost when playing off-TV on the GamePad — on which the visual style looks rather satisfying — or with the Wii U Pro Controller. There are two aspects to the controls that are to the title's slight detriment, however. One is the curiously lethargic aiming, which we complained about in the demo, that makes precision a tricky beast to master. It's not critical, and we've happily played through the entire game with various satisfying head shots, but it lacks a little of the smoothness normally associated with modern games. The second carries over from the 3DS version, which is the dodge move — the manual tells you a well-timed push of the stick is enough, while the game insists on you using the stick and B at the same time; we played safe by doing the latter. It's down to individual tastes, as mastering the dodge as a creature lunges at you is tricky and adds real tension in tougher areas; some may feel it's too fiddly, especially under pressure, though we'd suggest that gunning down monsters shouldn't always be a cake walk. 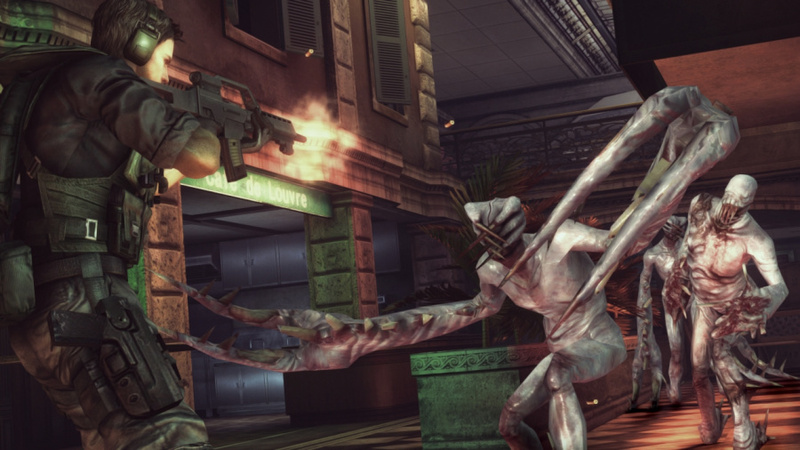 For tougher gamers, Resident Evil Revelations offers up two distinct features for those up for a challenge. One is the Infernal difficulty setting for the story mode which, rather than simply make enemies stronger, shakes up level designs with masses of foes, even early in the game. We'd suggest this mode is practically impossible right from the off, but is distinctly manageable in New Game+ — where you carry over your inventory — as even the earlier moments necessitate serious firepower. All of those weapons and upgrades that you track down in Casual or Normal difficulty may feel superfluous initially, but they come into their own in this more intense offering. The second, and sizeable, extra is Raid mode, thankfully recreated from the original title. Though it's playable in single player, we strongly recommend jumping into online co-op before blasting through levels, as two sets of guns will make lighter work and help in the pursuit of higher grades and more XP points. If one player dies, it's game over, so it's worth sticking together, at which point the GamePad screen's map becomes particularly useful. 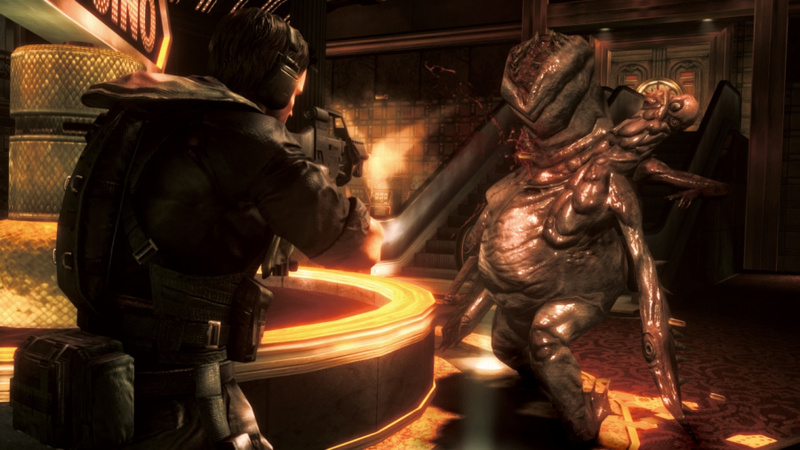 There are plenty of stages that are unlocked only by fully beating the main campaign, with increasingly difficult enemies and recommended player levels. With this mode you can forget about tension, atmosphere and a lot of what we referenced from the campaign, as it's just an arcade-style shooting gallery; it's rather fun, as a result. As you become a veteran you'll be blasting through stages in the quest to level up and unlock more costumes, weapons, upgrades and even more difficult levels. The interface has been polished since the 3DS, so managing your inventory, selling extraneous and obsolete kit and browsing the store with your in-game currency is intuitive and easy. This is an extra mode that can become rather engrossing due to its mindless action and well-crafted leveling system, so as a result fleshes out the package. The only downsides are the occasional jittery lag in monsters and the fact that in-game chat seems to be reserved for external headsets only; we attempted to use the GamePad microphone to no avail, making us wonder why the Revelations Wii U team didn't arrange a working lunch in the Capcom cafeteria to see how it was done by their Monster Hunter 3 Ultimate contemporaries. That strange omission with voice chat does rather sum up the Wii U-distinct features; decent but a little phoned in. There's nice Miiverse integration with "death" messages in the campaign, while you can also write a message for a creature bearing your name to show off while being gunned down in Raid mode. 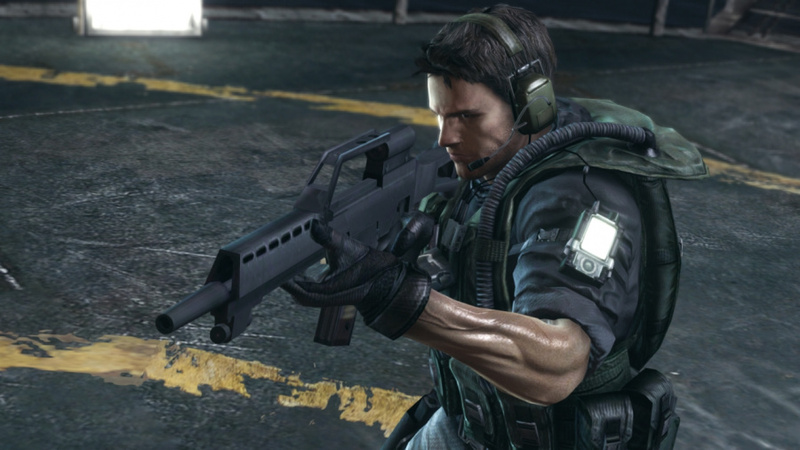 We have also been impressed with the simple and effective integration with ResidentEvil.net, which tracks your progress and helps you earn more weapons and goodies. Even with off-TV play added in, however, the lack of gyroscope scanning and the failure to use the mic on the controller are small features that would have been very welcome; perhaps the latter can be added in an update. There's also a nagging sense, in wider terms, that the single player experience in particular, including its environments and set pieces, have more impact on the smaller stereoscopic screen, with the higher resolution on the TV being an adequate stand-in, rather than a natural home. For those that haven't experienced the 3DS game, or simply want to dive in again in HD on a big screen, Resident Evil Revelations on Wii U is a worthwhile investment. This title arguably delivers the franchise experience that didn't quite succeed in Resident Evil 5 and 6, combining moody environments, scares, action set-pieces and silly, campy storytelling in one enjoyable package. Raid mode is also a fantastic extra, adding hours and hours of value as you can brainlessly gun down creatures with a stranger, leveling up as you go. If we had to choose a version to play, we'd lean to the 3DS, as what's exceptional and a perfect fit on the handheld is more in the very good category on Wii U. If we are to have a new home console Resident Evil experience in the near future, however, this remake should be taken as the starting point, as it shows that bombast and eye-watering budgets aren't the secrets to capturing the essence of the series. Going to get this at GameStop right now. NOOO, you give 9 and 10 to any retro stupid game from eShop and you give 8 to REvelations on its second version. Shame on you, Nintendo Life! If you are demanding be always demanding! Think I'll pass. The 3DS game was great, but it doesn't sound like there's enough here to justify another purchase. @Sun: Retro games are not stupid, buddy. Don't be hating on NL because they gave this an 8. An 8 the last time I checked is a great score. @KnightRider666 I don't hate nobody, just stating the facts. I believe that an 8 is a great score so you must have misread my comment, check it again: NOOO, you give 9 and 10 to any retro stupid game from eShop and you give 8 to REvelations on its second version. Shame on you, Nintendo Life! If you are demanding be always demanding! And yes, they have overrated lots of mediocre retro games. REvelations deserves same if not more even being a port. @Sun: I guess you're just not into retro gaming as much as I am. I would have thought the console version would have trumped the portable version to be honest. I will be getting this on the PS3 when it drops in price and I find it used. No reason to trudge through this yin again!! Game was brilliant . . . on the zenobia! Really felt like survival horror again - UNTIL you start playing the crappy resi 6 style action levels in the offices and the ice station with those 2 dorks! Half of a good game that could been great!! @Sun The review as a whole aims to reflect the thinking behind the score, and clearly I disagree that it deserves the same mark as the original... opinions and all that. As for retro games, you undermine yourself when you use language such as "retro stupid game" and "Shame on you, Nintendo Life! ", as they're not exactly reasoned ways to express yourself. Let's not compare apples to oranges, either, a Virtual Console title at $6 or whatever is a different proposition to a $50 retail experience, not to mention the fact that we have a whole team of reviewers with their own views on individual games. Still, no-one will ever agree with every review score. If they did it'd be a bit boring, really. Maybe they rated it lower because it is 10$ more than the original superior version? @ThomasBW84 Change "retro stupid games" for "retro mediocre games" (and I like some of them) and change "Shame on you" for "You are clearly unfair". I should have expressed myself like that. I don't want all your fans to attack me but it's a fact that you (Nintendo Life) have a tendency to overrate some kind of games and when it comes to a more "serious" profile you go the other way. That's why I think the reviews in here are not consistent at all and not a good reference compared to say Ign.com. On the other hand, I like some of the articles (and a few reviews). Isn't it more boring these people doing lip service and flattery all the time? 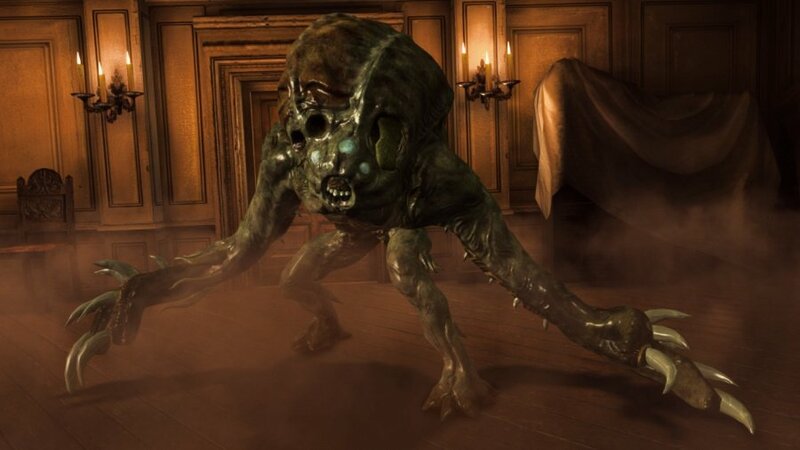 Resident evil 1 gamecube remake for the Wii u! ? Now that would be the ticket. Already have this wee gem on the 3ds. Just looking at the videos this game looked and moved like a 3DS game. Which to me is not a good thing. I'm actually surprised the score is that high. @TysonOfTime Agreed. The only review this should be compared to is the original so we can see which is recommended. In this case the original, which can probably be found for $20 now. In general it's pointless to say "Game A got this score why didn't Game B get this score?" as you really shouldn't and can't compare games. Especially Retro vs New (or in this case Remake). @Sun An 8 is just fine, great even. Why are you comparing this to retro games? That makes no sense whatsoever. If you feel the need to compare, compare it to the handheld version, which is still different and great all at the same time. There was no reason for a dramatic "NOOO" to open your statement either. That just set the wrong tone right off the get go. Just trying to help you out with some reasoning. @skjia So why did Ocarina of Time 3D get lots of 10 and 9 from the media? It is also a slightly improved port and got the same reviews than the original game thirteen years later (not one year later like REvelations). So why not give REvelations similar reviews than the original version? I mean, specially in here where reviewers tend to overrate so often. It's weird. @Prof_Elvin_Gadd Why don't you read my second message too? And this one too just in case! Might get this when it hits budget price since I already played through the 3DS version. @Sun: I dont know I always thought the reviews here were right on with my tastes. More so than other sites any way. But different strokes for different folks but still you dont have to be so negative and calling other games stupid. @Tasuki same for you, read my other messages. I still believe there are many mediocre retro games that are overrated but if you all want to defend Nintendo Life so much is okay but it is pointless as comments are to express our opinions! Read all, man! I still believe there are many mediocre retro games that are overrated but if you all want to defend Nintendo Life so much is okay but it is pointless and the comments are to express our opinions! Why does the phrase if you cant say anything nice dont say anything at all come to mind. Anyway lets not go down this road please we all said our peace now lets just move on please. @Tasuki Why should I not say that I disagree with the review? You are behaving like a little dictator now. I can say whatever my opinion is even if you don't like it. An 8 is a great score. What's up with the number 8? If they used the me mindset to review retro and new games, now that would be unfair, because no retro game ever would go over 5. @Sun Well Ocarina of Time 3D was not a lazy port and it was a good alternative to the original. And there are still those that prefer the original. This review is on the side that RE: Revelations 3DS is better than the Wii U version and cheaper so it would score slightly lower. Got it! It has a black box not the usual white one. @LDXD @Morphtorok It's not about the number so please before answering me read my messages. Funny that you say relax to me when fiends came over me just because I was expressing my opinion. Actually I formally request a message from any person from the staff inviting me to not express my opinion again and I will do as they say whether my opinion is good or bad. I do not want to disturb you. Thanks. @Sun: Its one thing to have an opinion but to say and I quote "NOOO, you give 9 and 10 to any retro stupid game from eShop and you give 8 to REvelations on its second version. Shame on you, Nintendo Life! If you are demanding be always demanding!" NOOO, you give 9 and 10 to any retro game from eShop and you give 8 to REvelations on its second version. Shame on you, Nintendo Life! If you are demanding be always demanding! And that still expresses your opinion. Thats what I am getting at. And attacking the staff, Shame on you. It's just better suited on the system it was originally made for. I tried the PS3 demo last week and it didn't feel right to me. The game's layout and controls are kinda too limited for something i'd want to play on consoles (should've been ported to vita instead really). The scanning element especially feels even more awkward than usual too. Doesn't help that the last RE i played was 6 (horrible game but with MUCH better controls). @Tasuki That is not what I said so copy paste all my messages not the first one three times and twisted. I think the biggest factor for me in the comparison between the two is how Raid Mode will fair over time. If it gets more DLC areas or even just challenges like in MH3U then I would gladly score it higher than the 3DS title. Not that the single player mode isn't great but you end spending way much more time in raid mode. Though that's something you can't really factor into your review since no one has any idea about it for sure. Another thing that I will find out eventually is if Infernal really has "random" enemy and item placement as currently stated by Capcom before release. If so that will add hours upon hours of extra play time to Single Player over the 3DS version. If they patch that foolish decision about chat headsets that would up the score for me as well. They seemed to add off TV to MH3U because enough people complained. I can't see the the audio input to be an awfully complex patch either. Especially as you stated in your review their are developers at Capcom that know how to do it. I really agree with your Artistic Design comments though. It's obviously an upscaled 3DS game (well with better character models) but like MHU3 it can have some really beautiful or beautifully disturbing moments. @Sun: It's not what you said, it's how you said it; you're welcome to disagree all you like, but not to the point where you get hostile. Tom and Phil have both expressed Nintendo Life's stance on our reviews, and you have also had your say. We'd appreciate it if you were to move on now and allow others to chime in regarding our review and how they feel about the game in this thread — if you have any further questions, comments, or concerns you'd like to share with the editorial team, please get in touch directly and they'll be glad to get back to you. Thanks in advance! I downloaded the demo the other night. I didn't have time to play much but it seemed legit. How much is this in the eShop??? This doesn't make sense, the 3ds version got a 9 out of 10 and this game offers more things!! Doesn't make sense but ok lol I would rather play this game on the Wii U than 3DS, personally. I am glad to read opinions of other people at this place! Of course if it is objective or subjective, but maybe with less "harsh" words. "The question is whether the scares, thrills and environments are as brooding, menacing and enticing as on the portable platform." Guys it's the same game!! it even has more things than the portable version. I've said it before in my comments, your game reviews would be consistent if you came up with a rubric for all your staff to follow and let us see each item of the rubric, and then comment on each.... this is a clear example of inconsistency. good review, thanks! I will be buying this. I didn't play the 3DS version and an 8 sounds fair to me. What with ZombiU getting panned by critics and I love that one, this has to be good. played on 3ds so i wont be getting it,its okay but not the best res that would be 4.or one in the mansion were it all started. Don't think I'll bother with this since I only found the original on the 3DS 'alright.' The series has somewhat slowly lost its way since the days of RE4 in my opinion. Pikmin 3 can't come soon enough. @ivanmata You mean like "Graphics: 7, Sound: 8, Gameplay: 7" etc? We're not doing that, sorry! We already have a bunch of pretty stars to use; we don't need any more. We don't feel this score is inconsistent at all. The game was designed for a handheld and a lot of the shortcuts they can get away with (e.g. marionette enemy animation, texture detail or goofy low-poly models) on a handheld are much more glaring on a big screen. So, its faults are far more obvious and can more easily hinder one's enjoyment. -The graphics have a grittier look (which adds to the atmosphere) and lack the "sheen" from the HD which I personally found distracting. -3DS Multiplayer is both online and local meaning that when Capcom eventually shuts down servers for either version, you can still do multiplayer on the 3DS where the consoles get screwed. The list can go on but you get the point, the 3DS version is the best experience and it makes more sense to buy that version for $20 now and then wait a year or two for Capcom to release a new Wii U version with all DLC for $20. I'll be getting this on the Wii U in early June. I'll get the 3DS version when I get a 3DS later this summer. Love Resident Evil, so naturally I'm not a fan of Operation Raccoon City 5 or 6. I'll probably just end up buying the Nintendo 3DS version since it is pretty cheap right now and I happen to like the 3D effect quite a bit. I also expected most of the issues mentioned in the review so they weren't a surprise to me. @bezerker99 It's $49.99 in the Wii U Eshop. Good review there. I've already gone through this once though, and I don't particularly want retread the same territory for only a few extra features. Also the fact that while I found Revelations ok, I felt a little sick at some points during the main campaign. My gore meter is not very tolerant, but it wasn't as bad as what I've seen in past titles. I still hold onto my 3DS copy as I like doing the raid mode with friends, but that's about it. @Dpullam I agree the 3d effect definitely makes me more likely to purchase that version instead. Downloading it now. I thought it said 14GB in size, so I'll get to fire it up before bed tonight. Enjoyed the 3DS version but I really wanted to hear the game on a good stereo system, so I was happy when they said it was being ported. Plus, the points from the download will make one of those Zelda titles free for me next week. Bonus. Thanks for the review NL ... and also thanks for making an effort to keep these replies polite and mature for those of us who tire of back and forth arguing. Appreciate it! Original price was 45€ and the Circle Pad Pro XL is 30€ (that's what I paid). That is 75€. If you are talking about current price is 30 for game (not 20) + 30 (CPPXL) = 60 although you can find CPP XL cheaper (around 20€, that makes 50€). Gyro control is annoying for most people. Analogue controls are still analogue controls and it is actually much more comfortable on the Wii U GamePad or Wii U pro controller than on the 3DS. I own the Circle Pad Pro XL and it improves the control on the 3DS but after a few hours it is very uncomfortable if not painful, both circle pads I mean and the reason is because they are flat and not ergonomic as the ones on Wii U. The 3DS version is the BEST version for two main reasons: the gyroscopic controls for the scanner and aiming (which baffles me as to why Capcom didn't even bother), and the 3D effect truly did add TONS of atmosphere to the game. It sort of infuriates me that Capcom would have the audacity to strip the game of these control options - heck, even Wiimote+nunchuck as an option would have been great - and still charge 50 bucks for this port. So yeah, I'd say NL was completely fair with giving it an 8, because the extras do not make up for what was lost in translation. Got this game reserved, picking it up the moment it's released over here in Europe. Can't wait, even if I already cleared the 3DS one 100%! I understand and see the differences between the 3DS & WiiU version. I was iffy about getting it on the WiiU but decided to buy it today and as im playing it now i have no regrets. A good game is a good game and i like all these mixed reviews because regardless i'll make my own decision regardless of scores but also appreciate the other perspectives brought to the table. I really like this game and also like this review. Coming from somebody who has stuck with the RE series like Zombie glue since the original PSX release, RE: Revelations desserves no more than an 8. It's a complete mixed bag and comes off like a split personality, Instead of going straight back to RE's roots (ala 1-3, Remake & Zero) half of the time it completely goes the other way with it's bland mindless episodic shoot out-filler which ends up feeling like a cheap way to extend the game rather than 'appealing' to both Classic and modern RE fans. This game has some brilliant moments(The final Boss battle and last 15 minutes of the game are unforgettable, not to mention a tease to the remake fans!) but it still smells of 'Sell Out' 50% of the time. And i'm suprised they never delved into more complex & creative puzzle solving ala the 3DS's touch screen. Instead you'll be picking/screwdriving and lining up the same few puzzles during the entire game. The first time it's pretty neat, but eventually it wears thin. Where's the creativity? Silen Hill: Shattered Memories had some real fun puzzles! Even unzipping jackets with pointer controls was Super cool. I would love to see some mini Zack & Wiki-esque stylus based puzzle solving thrown into the mix to fit the RE World. Oh and the plot is possibly the worst the franchise has seen yet! Talk about convoluted, confusing and uninteresting, with one forgettable lead villian to boot! And I'm still not too sure what to think about the swimming portion of the game! Anyways, the Wii U version of this would of been an insta buy, but the Bone heads at Capcom didn't include Pointer controls as an alternate control scheme...Nor did they impliment the Gamepad's screen in any unique way. It just seems like a bit of a waste as if the Wii U release was a last minute effort. I'll check out the demo, see how the clunky analog stick aiming fairs(again....) and the unimpressive upscaled 3DS & 3D-less graphics. Yippie! I'd rather fork over the Koopa Coins for Injustice:Gods among us at this point, aside from already owning NSMB.U, Nintendo Land & Zombi.U. Had Revelations supported Pointer controls I would pick it up in a T-Virus infected heart beat! But as is, I'll just wait for it to drop in price. I played through the game probably 3 or 4 times on 3DS but still picked it up for PS3. I agree with the review, you can tell this game was clearly meant to be experienced on 3DS, however, the vast majority of RE fans I know don't care about handheld games so I'm glad this is getting out to more people because regardless of its played at home or on the go, it's a great game and, imo, the best Resident Evil since Code Veronica. It's better than 3, 4, 5 and 6 by a lot. Exactly. This my favorite RE since REmake. Not that I didn't love RE 4 or RE 2. It's great that more people get to experince this game. It also has my favorite secondary character since Barry with Parker. Yeah, I didn't really care much for the other new characters but Parker is cool. I hope to see him in future RE's. Just got this on 3DS. Love it but I'll wait for the price to drop on Wii U.
I'l probably pick it up when it hits the bargain bin. To anyone having trouble with the dodge I just got the hang of it again. Don't bother pressing B, just press up or down on the stick. If are walking and about to be hit release the stick then press it again it at what would have been the point of contact. It's not easy and sometimes I still don't time it right but if it was the game would be far too easy. @Waveboy even though I really like Revelations on 3DS, I always enjoy reading what you have to say. You're a true fan of Ninty in general and your comments are always super intelligent. Also, this is not a return to form for Res Evil, its more Dead Space than RE. And the puzzles are awful. Really? No Wii remote/nunchuck option? It could have used the gamepad screen and motion controls in many interesting ways, but it clearly doesn't, so no reasons for a second dip. Here in europe this game is € 60 and Zombi U is now € 30. For those who didn't play the Ubisoft game I think the choice is very simple. Love the game on 3DS,and I've played through it many times. And as much as I'd like to get this HD version,I think I'll wait till it goes under the £25 mark. When I played the 3DS version I was surprised how fun Raid mode was. does the 3ds version have good online play and is a circle pad pro needed to make it a fun game or is it fine without? I don't know about the online play but it controlled fine without the pro. I played it without the circle pad pro and it was a non-issue. If you're interested in the game at all and can afford it, it's definitely worth the purchase. And just for that i shall reward you with a King Hippo Mango pixel slushi straight from the depths of good ol' videoland. tee hee. I'll be buying the Wii U version of this. Was considering the xbox version, but the xbox one has left such a sour taste in my mouth, that i dont want to give them my money. no effort to tune up dodge mechanic = auto-pass. If the mechanic doesn't work, don't include it (and plan the game around the mechanic not existing). Dodge ruined the game for me - only made it about 40% of the way through. IGNorance.com, better than NL in reviews? What laughable garbage. Nice reviee Thomas, some people just don't appreciate variety. I never knew how to dodge properly, it just happened by fluke...I'm 'this' close to pulling the trigger on Revelations U but i'm really turned off by the half a**ed lazy Wii U game pad additions and NO Wii remote pointer controls as an alternate control scheme. This was never ment to be released on the Wii U and it shows. currently on sale on the eShop for $19.99! Just read the review after downloading this for $19.99 during the Halloween sale. It pays to wait. Looking forward to getting around to this sometime soon!